It was with great enthusiasm and dedication that six youth Training Crew members of Pine Grove Youth Conservation Camp assisted in the Annual Book Sale for the Amador County American Legion Club. Directed by veteran staff member, YCC Omar Hill, they moved books from storage on Friday and helped set up for the book sale held over the weekend. Then, they returned on Monday to help pack and transport books back to storage. 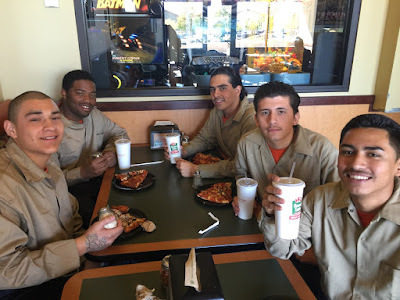 With much appreciation for all of the youth’s efforts, the Amador County American Legion Club graciously treated the youth training crew to pizza and sodas at Round Table Pizza. If you are considering removing your lawn, replace it with native California plants. These will survive with less water, can tolerate our hot summers, are better adapted to our soils, and do not require pesticides and fertilizers. California native plants benefit ten to fifty times the number of species of wildlife as non-native plants. Give wildlife a drink! 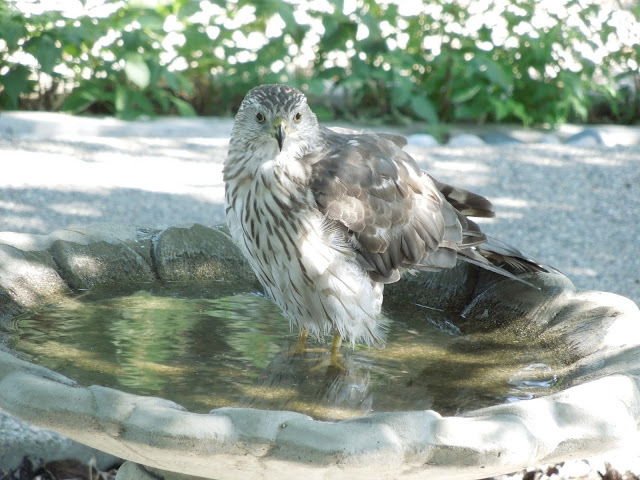 Tri County Wildlife Care, a local nonprofit started in 1994, is dedicated to the rescue and rehabilitation of our native wildlife and helping our community live in balance with wildlife. They envision a world where wildlife and people thrive together. 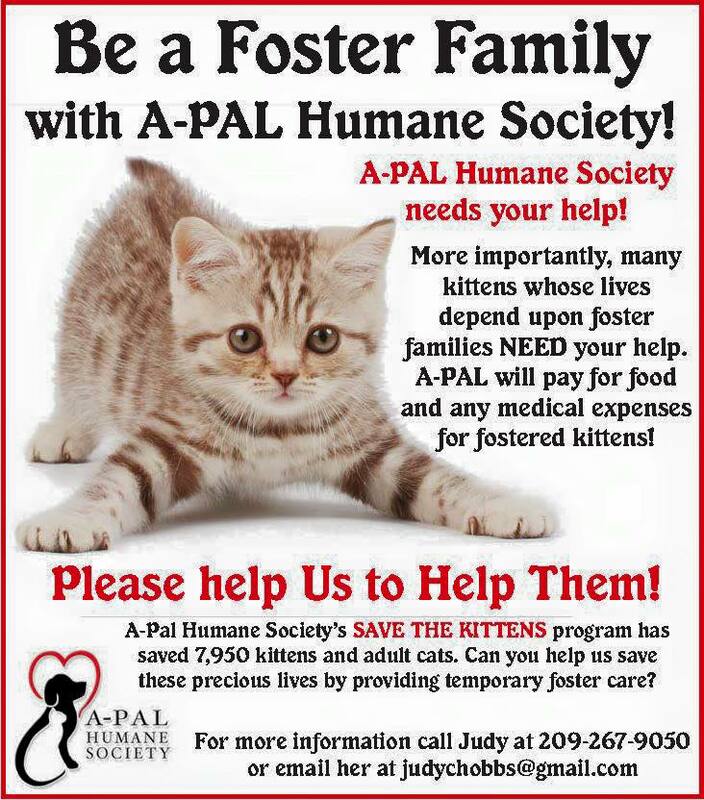 For more information call 209-281-EAGL (3245) or visit www.pawspartners.org. 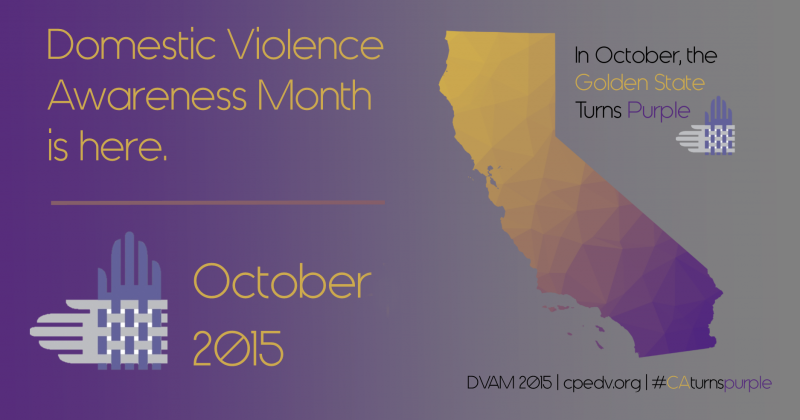 October is Domestic Violence Awareness Month and the Golden State is turning PURPLE! During the month of October, help us STOP domestic violence in our community, and increase awareness of the issue. For the past month or so, our staff was busy with a move to our new location, and setting up the Donation Center for the Butte Fire, so we will not be holding our annual Purple Soldier Neon Fun Run or placing purple people around the county. Purple Soldier Baskets will be located at various locations around Amador County. Like our Facebook page and watch for facts and informational videos throughout the month. 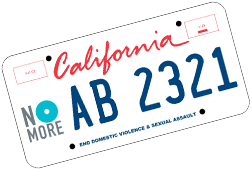 Join the fight to end domestic violence & sexual assault with your license plate! License Plate Challenge - October 16-23: Help fund domestic violence and sexual assault with your license plate! Pre-order the California Says NO MORE License plate and help us reach our goal of 500 in one week! On September 11th Operation Care was asked by the Butte Fire Command Center in Plymouth to open a donation center for victims of the fire. Operation Care staff and volunteers and many local volunteers set up and manned the donation center. The outpouring of support from our community was overwhelming, and the center was filled with clothing, toiletries, pet food, water, and so many other contributions. 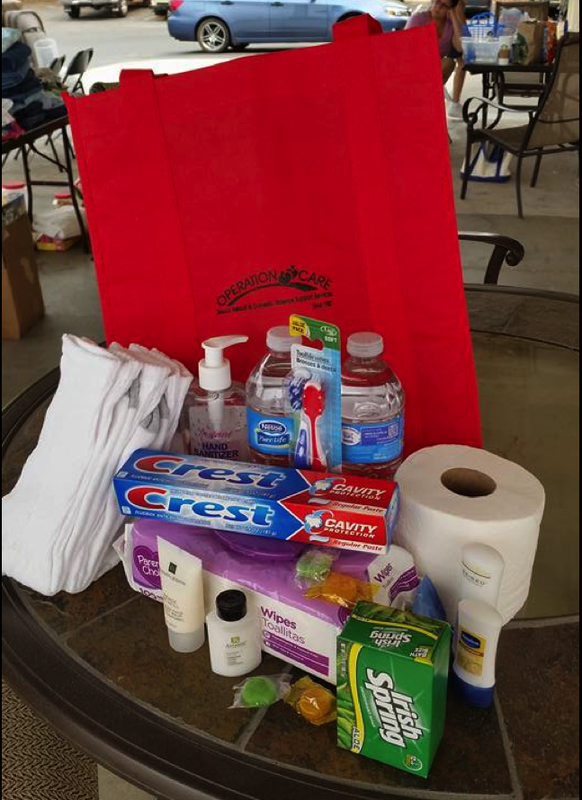 We created donation bags and delivered them to families who were displaced. We also delivered items to the hotels in Jackson and Sutter Creek who were housing CDF and evacuees as well as the local churches. We closed our donation center on September 15th and distributed numerous truckloads all of the items to local community organizations and to the evacuation center in San Andreas. A BIG THANK YOU to Mariah Toy Storage, 11400 Hwy 49 and Sterling Auto for allowing us to use their facility to set up as a donation center. And THANK YOU to the community members and agencies that donated to or helped with the Donation Center! This was a true example of a generous and caring community pulling together during a crisis. Operation Care has many volunteer opportunities available, from office help to community outreach to client services. We need your help! Volunteering not only helps our client's directly but also indirectly by helping us meet our match for our CalOES grants. If you are interested, please contact our volunteer coordinator: Janet Saxton at 223-2897. 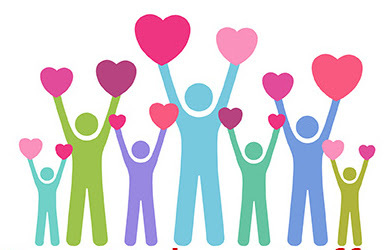 Having had a previous career in the health field and then being a stay at home mom for quite some time, I began volunteering at Operation Care a couple of years ago. After taking the Domestic Violence Certification Training last spring I was hired as the Volunteer Coordinator. Operation Care successfully runs due to the people who work here, including the volunteers and the board members. All deserve recognition for their dedicated and satisfying work. The volunteers at Operation Care are the best! They diligently work hard expecting nothing in return except the "reward" of knowing that they are serving their community in an area that is often overlooked but much needed. Thank you to all the volunteers for donating your time and effort to Operation Care! You are appreciated more than you could know." 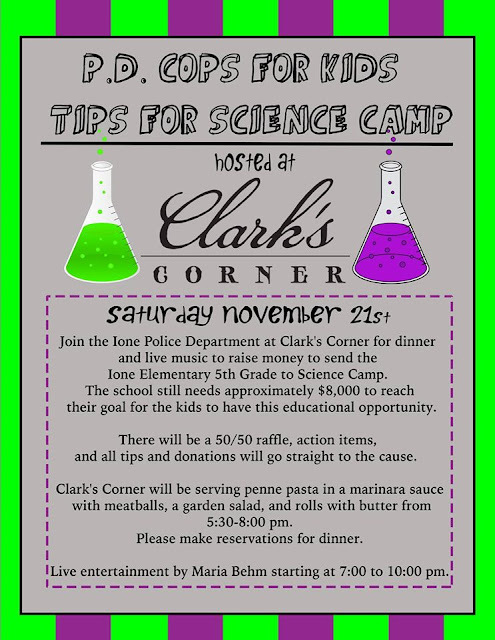 October, 2015 - Amador County, CA - It seems there are so many awareness campaigns, national recognition days, and foundations that one could choose a different cause to support every day. Operation Care is asking you join the Golden State in turning purple, and take a moment to think about domestic violence and the role it plays in our small community. Amador County is not immune to this global epidemic. This year alone, Operation Care, a local organization founded in 1980 to help victims of domestic violence and sexual assault, has helped 228 women and men who have been abused by their partners. That's why Operation Care is urging you to join the California Partnership to End Domestic Violence and over 1,000 advocates, organizations and allied groups throughout the Golden State of California in wearing purple, the national color of domestic violence awareness. 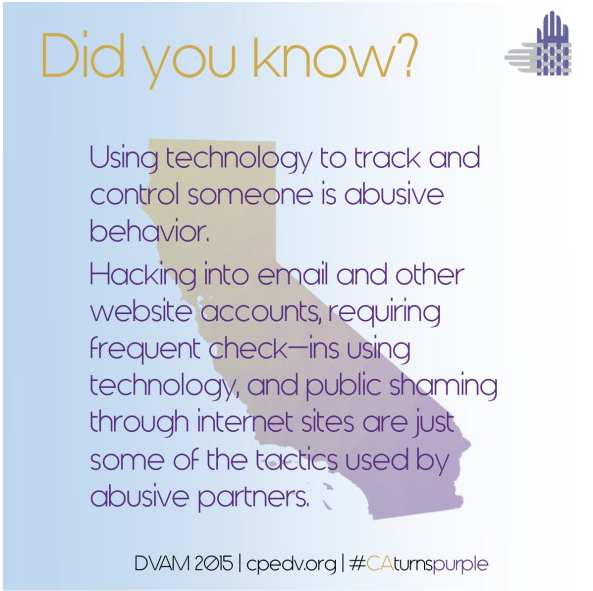 using technology to track and controlsomeone is abusive behavior. Hacking into email and other website accounts, requiring frequent check-ins using technology, and public shaming through internet sites are just some of the tactics used by abusive partners. Domestic violence is often kept very silent. Family, friends and neighbors are often afraid to rock the boat by taking action. Operation Care's goal is to bring this issue into the open and bring the community together in a collective commitment to end the violence. 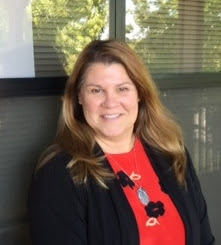 "We are asking everyone to to take action," said Tammie Crabtree, Executive Director of Operation Care, "not only by wearing purple, but by speaking out against violence." Physical violence can escalate over time, and can even end in death. Children living in an abusive household will carry the scars from their childhood into adulthood. "The only way to stop the violence is to not tolerate it," said Tammie. "Say something. Do something. If you witness a friend or loved one in an abusive situation, confront them. Tell them it is not OK to be verbally, physically, or emotionally abused, and that there is help available to them. If you find yourself in a violent relationship, don't stay, get help." October is nationally recognized as Domestic Violence Awareness Month. Purple Peace baskets have been placed at various locations throughout the community. Each basket is filled with free purple bracelets, ribbons, and stickers. 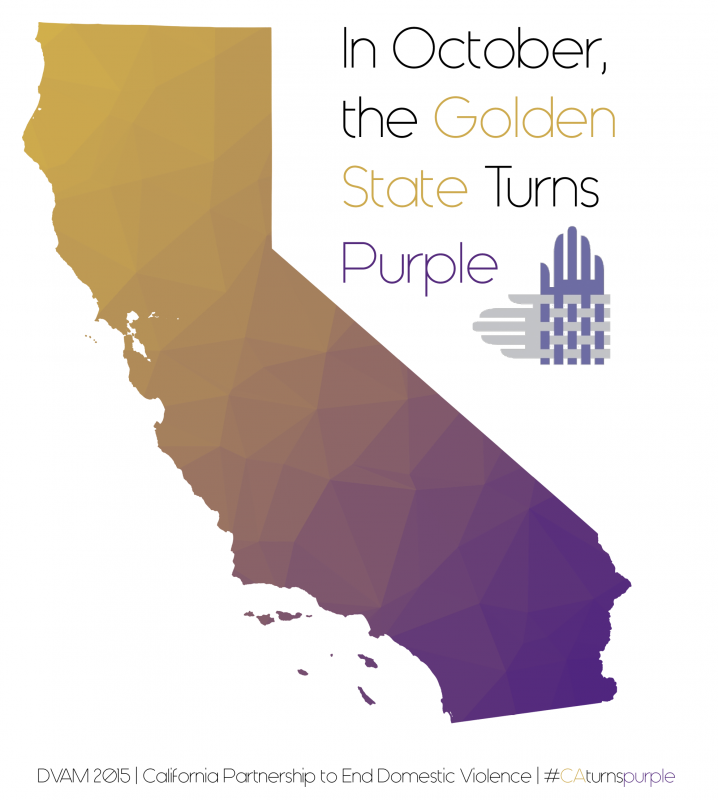 Operation Care urges you to join The Golden State and wear your purple in support of Domestic Violence Awareness Month and increasing awareness of domestic violence. Because the last month kept Operation Care staff and volunteers busy with a move to their new location at 817 Court Street, Suite 12, Jackson, and setting up a Donation Center for the Butte Fire, they will not be holding their annual Purple Soldier Neon Fun Run or placing purple people around the county. 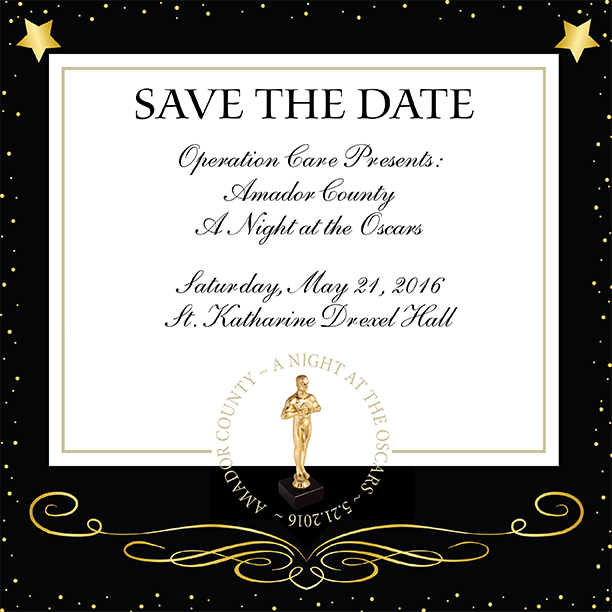 Operation Care has been providing services and safe shelter for victims of domestic violence and sexual assault for thirty-five years. During the 2014/15 fiscal year, advocates helped 228 domestic violence victims, and 42 women and children were provided safe shelter. Staff provided 279 peer counseling sessions with men, women and children and hundreds of transports to appointments, court, and other locations. The mission of the organization is to provide domestic violence and sexual assault support services, crisis intervention and education in our community. For more information call 209-223-2897 or visit www.operationcare.org andwww.facebook.com/operationcare.